The hotel is set in extensive landscaped grounds overlooking the panoramic view of Naama Bay and the Sinai Desert and mountains. Enjoy the sun and the sea on our extensive collection of beaches near the hotel or by the swimming pools. Whether with your partner or family, enjoy a unique holiday doing whatever you please. Free beach around 8km (scheduled shuttle service available). Naama Bay Beach with extra charge around 2 KM walking distance from the hotel. These rates are intended for use by European nationals. Other nationalities are subject to additional charges levied at the time of check in. Make yourself at home in one of the 143 air-conditioned rooms featuring refrigerators and LCD televisions. Your bed comes with Egyptian cotton sheets, and all rooms are furnished with sofa beds. Satellite television is provided for your entertainment. Private bathrooms with showers feature complimentary toiletries and hair dryers. This hotel is ideal for couples and families looking for a good standard of accommodation in a popular area of Sharm El Sheikh. The hotel has a good selection of facilities, is close to the beach, the airport and the lively centre of Naama Bay. The recently opened Falcon Naama Star Hotel is set against a mountainous backdrop at the top of the Naama Bay resort area. The excellent bars, restaurants and nightlife the area is popular for is just two minutes away. The beautiful beach and the clear inviting waters of the Red Sea are also just a short stroll from the Naama Star Hotel. These rates are intended for use by European nationals. Other nationalities are subject to additional charges levied at the time of check in. Enjoy a meal at the restaurant, or stay in and take advantage of the resort's 24-hour room service. Relax with your favorite drink at the bar/lounge or the poolside bar. A complimentary buffet breakfast is included. Take advantage of recreation opportunities such as an outdoor pool or take in the view from a terrace and a garden. The complimentary beach shuttle makes getting to the surf and sand a breeze. Dip into one of the 5 outdoor swimming pools or enjoy other recreational amenities including a health club and a lazy river. Additional features at this Mediterranean hotel include complimentary wireless Internet access, concierge services, and babysitting/childcare (surcharge). This charming, family-friendly hotel comprises a total of 390 rooms and is ideal for business travellers and holidaymakers alike. Facilities on offer to guests at this air-conditioned establishment include a lobby area with a 24-hour reception and check-out service, a hotel safe, a currency exchange facility, a cloakroom and a hairdressing salon. It has an auditorium and the younger guests can let off steam in the children's playground or at the kids' club. There is a bar, a pub, and a restaurant, and business travellers will appreciate the conference facilities and WLAN Internet access(extra charge). Guests may also take advantage of the room and laundry services and there is a car park and covered garage parking available for those arriving by car. Whether guests choose to dance the night away in unique and delightful surroundings or enjoy the taste of the different flavours of an Egyptian shisha, this hotel is the perfect place for a holiday to remember. These rates are intended for use by European nationals. Other nationalities are subject to additional charges levied at the time of check in. A stay at The Regnum Halomy Hotel places you in the heart of Sharm el Sheikh, within a 15-minute walk of Naama Bay and Naama Bay Beach. This 4-star hotel is 10.9 mi (17.5 km) from Nabq Bay and 2.2 mi (3.5 km) from Shark's Bay. This family-friendly city beach hotel comprises a total of 126 rooms, most of them with a terrace/balcony. A kids' corner situated within the hotel, offering plenty of games and a playground, welcomes children all day long. Situated at the southern tip of the on the Sinai Peninsula, Sharm El Sheikh Hotels offer access to one of Egypt's most popular destinations, surrounded by white sands, blue waters and designer shops. The waters around Sharm El Sheikh are brimming with sea life and the area offers some of the best scuba-diving locations in the world. There are a number of excellent spots to visit, from the Straits of Tiran in the north to Ras Mohamed in the south. One of the most popular diving locations is Shark's Bay, a short drive north of Na'ama Bay and a great destination for coming face to face with parrotfish, puffer fish and stingrays. The underwater coral reefs are similarly ideal for seeing a variety of exotic fish. Jackson Reef, Woodhouse Reef, Thomas Reef and Gordon Reef are all fantastic diving sites. Also worth visiting is Ras Mohamed National Park where you'll find the wrecks of a number of ships, including the SS Thistlegorm, a British ship sunk by Germans during the Second World War. As well as diving, Sharm El Sheikh is an ideal place for everything from windsurfing to canoeing. You'll find a selection of watersports centres dotted along the beach area. Away from the blue waters that surround Sharm El Sheikh you'll find the vast Sinai desert. While setting off alone into the desert isn't recommended, there are a number of exciting trips offering everything from quad bike tours to a chance to watch a sun set over the desert dunes. There are also motorbike and horse riding trips in the desert – both exhilarating ways to explore this sublimely beautiful landscape. On the west side of Sharm El Sheikh you'll find the Old Market, an authentic Egyptian marketplace. You'll need to practice your haggling skills to get the best deals as you drift from stall to stall, past shops selling colourful jewellery, perfume bottles, pottery, trinkets and clothes. There are also plenty of restaurants in the market where you can sample an array of mouth-watering local specialities and international favourites. Na'ama Bay is a slightly more upmarket option, with another selection of interesting shops and stalls to peruse. The Camel Bar and Roof in Na'ama Bay is a sociable place to unwind with a cocktail and a shisha pipe and the area also has a selection of restaurants. 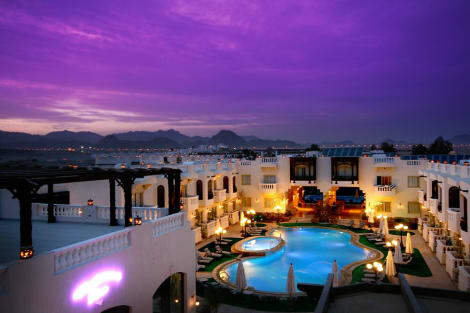 The resort of Sharm El Sheikh has a lively nightlife, featuring a collection of western and Arabic-style bars. Farsha Café is a Bedouin-style bar complete with floor cushions and lamps – a nice place to escape the afternoon heat with a coffee and a shisha pipe. Harry's Pub is an English-style watering hole that's very popular with tourists and expats while Pacha is the resort's main club and an excellent place for drinks and dancing late into the night.